It’s sometimes hard to say why you decide to back a game on Kickstarter. Sometimes, it’s just the attitude of the designer/publisher and some of the buzz on Twitter or around the game that puts the bug in your ear. Sometimes, it’s the mechanics that look interesting at first blush, or the subject. Sometimes, and for me this is not as common, it’s the art or the minis. 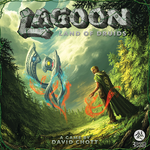 In the case of Lagoon: Land of the Druids, the art attracted my eyes a little bit. It was nice and kind of stood away from the typical fantasy art. And then I started to see some buzz coming from Unpub 4. So when it came to Kickstarter, I took a look. Didn’t check the video (I find these less and less interesting since they tend to have little to do with the actual game/mechanics and more to do with “carnival barker” type thing) but what really caught my eyes was the fact that the designer/publisher had put up the entire game as a print-and-play, which I proceeded to download. The game looked interesting and what’s more, it was a simple matter to print it and try it out. What did I think? Let’s check it out. This entry was posted in Review and tagged lagoon on February 15, 2014 by TopDog. Kickstarting Some Games: Lagoon, Tiny Epic Kingdom, Scoville and more! I haven’t done one of these posts in quite some time as I am trying to reduce the amount of projects that I back on Kickstarter. I’ve slowed down somewhat, but I am not that particularly successful as I’m still backing quite a few projects. One of the aspects that help me with this is the shipping cost to Canada, which through no fault of the people creating Kickstarters, is becoming outrageous. A lot of the time, while I might want to help out and back a project, the cost of shipping is so high that I end up waiting for the project to successfully fund, hoping to be able to buy it from a local retailer once it comes out. This bring out a dilemma: do you back it, giving the creators money directly and maybe getting some exclusives at the same time or do you wait for it to come out, maybe check out the early reviews and pay less from an online retailer? For me, it’s always a question of just who is putting out the game in the first place. If it’s a larger company or someone who I’m pretty sure will actually put out the project, I’ll wait and pay less. If it’s something that looks really neat or a project from a first timer, I’ll back it a lot of the time, simply to help out. Let’s check out the latest batch of projects that I’ve backed. This entry was posted in Kickstarter and tagged draco magi, how to human, lagoon, scoville, storyscape, this town ain't big enough for the 2-4 of us, timewatch, tiny epic kingdom on February 9, 2014 by TopDog.